No Bending, Climbing, Or Straining Your Back! If you are looking for a product to help easily pick up and grab objects in hard to reach places, Portable Grabber & Reacher Tool is the product for you. Open the tool around the object you want to grab, squeeze the Portable Grabber & Reacher Tool ergonomic handle and it will ratchet closed around the object. The Portable Grabber & Reacher Tool swivels 90 degrees allowing you to easily reach for products that are in tight or awkward places. Built in LED light, jewelry hook, and magnet help grab even the smallest hard to get items. Portable Grabber & Reacher Tool can pick up and hold up to 5 lbs. 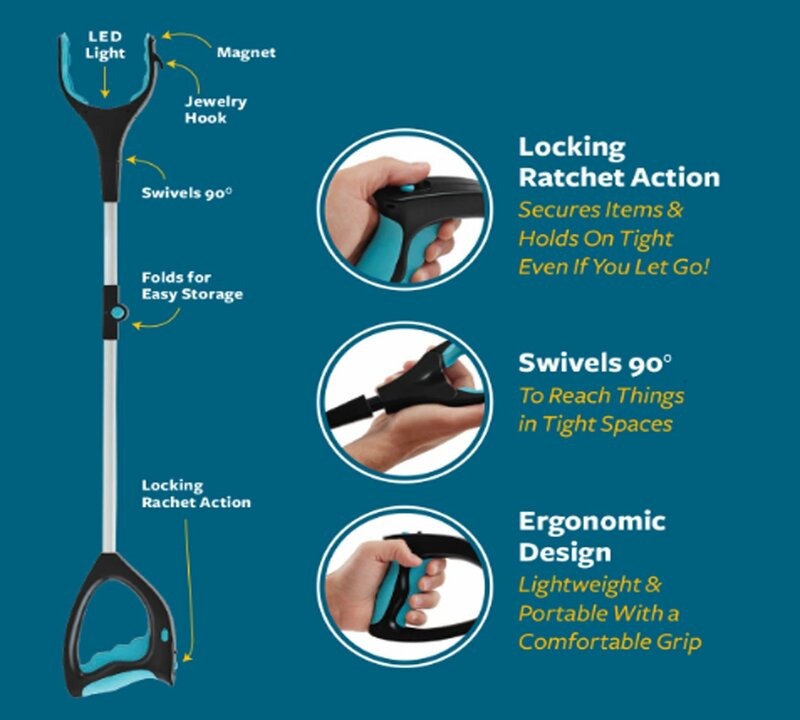 FEATURES – Foldable for easy storage, built in LED light, jewelry hook, and magnet help grab even the smallest hard to get items. Material: Aluminum Alloy + High Strength ABS & TPR. Folded size: Folding about 42cm/16.5 inch; Expansion 81cm/32 inch. Portable Grabber & Reacher Tool, pick-up and clean-up tool is great for use in the home and around the yard. Also provides help for the physically disabled. This is a must have for anyone who needs a helping hand and wants less back strain.